The composition, from Film Composers United, is at least a year old, and has been passed around from site to site. 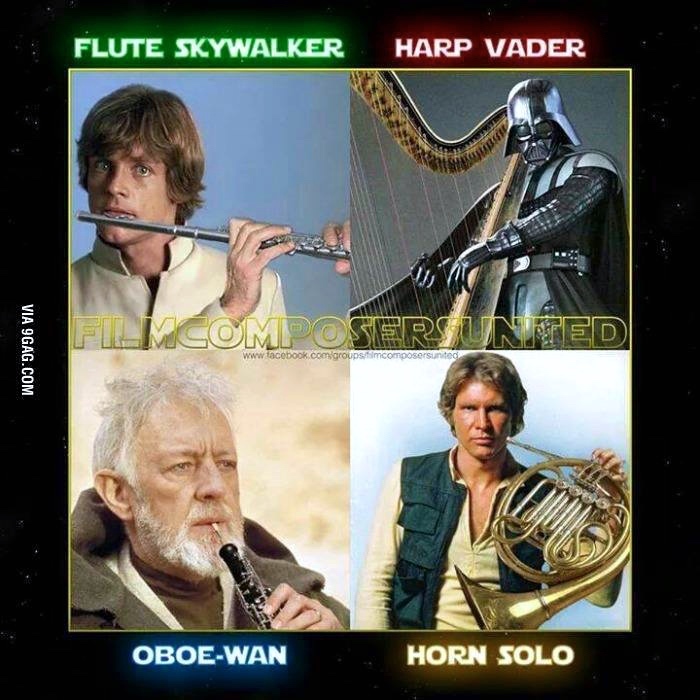 In case you don’t know the characters from the movies and their names in the movies, they are, starting from the upper left and moving clockwise: Luke Skywalker (on flute), Darth Vader (on harp), Han Solo (on (French) horn), and Obi-Wan (Kenobi) (on oboe). The puns are moderately distant, but the originals for the instrument names are heavily determined by the second element of the names (so long as you know those names). This entry was posted on December 28, 2015 at 3:27 am and is filed under Movies and tv, Music, Puns. You can follow any responses to this entry through the RSS 2.0 feed. You can leave a response, or trackback from your own site.